I'm a descendent of Thomas Cross and Sarah Boardman Cross. A very beautiful site, Thanks. Thank you for taking the time and effort in making this burial ground available for the descendants of the deceased to visit the gravesite's of their ancestors. I truly appreciate this site. I've only glanced over this website, and love it already!! Not living close to my husband's family's stomping grounds you provide such a helpful resource!! I appreciate the time you took to do all the work necessary to have this wonderful site up and running!! Thanks so very much!!! It is our hopes that the level of awareness of the importance of maintaining our historical burial grounds will continue to rise. It saddens me when I read a post that someone entered the burial ground and found the care to be lacking. This has been my struggle for years. I have been unable to maintain the burial ground up to the standards it deserves due to the lack of funding and can not support the upkeep personally. Donations are vital and I have been fortunate to have the support of the TFA to give what they can when they can. I have also been extremely fortunate for John Hardy's generous contribution for the initial clean up in 2009. Since then, little monies have been available and most of the work that has been done, has been pro bono. Currently we are working with the City of Haverhill to help fund our efforts. It takes a village. We need to continue to raise awareness and money. We will continue to do what we can. If anyone is interested in making donations for the OBBG you can make your check payable to Brightside of Haverhill, a nonprofit organization so your donation is tax deductible. Just make sure to memo Bradford Burial Ground on your check. Together we can make a difference. Let's give this sacred ground the care and respect it deserves. 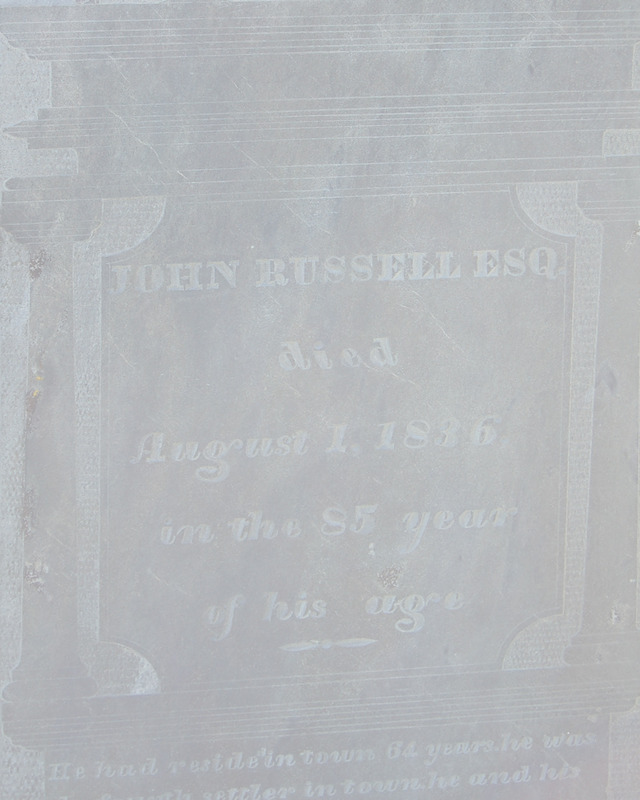 Visited the Bradford Burial Ground to find records of old Hall and Kimball family members. We were able to find a handful and get pictures at the site. The grounds crew was there that day trimming down the grass and they were helpful in getting us oriented on where to look. We were truly grateful for our chance to visit the Burial Grounds. There is much more work to do on cleaning up the brush on the edges of the Burial Grounds as there were a few others we found by wandering into the brush. But we are grateful for what has been done recently on cleaning a lot of the plants up. Thanks. I have been a self taught genealogist since 1978. I am a paternal male descendant of the Kimball family. Long story about my last name and how I discovered my Kimball ancestry in March, 2008 after I paid for numerous DNA tests. I visited the cemetery on 31 July 2013 and I was not happy with the upkeep of the cemetery. As one faces the cemetery from Salem street, the upper left quadrant is covered with small trees, thorn bushes and weeds which have taken over a number of headstones. This cemetery is such a historic site and could be a major historic tourist attraction. The headstones need to be protected from weathering and stabilized before they are lost forever. As one who is a student of history and genealogy, I was surprised at the number of folks I spoke with in Bradford/Haverhill who knew nothing about the cemetery. I am also surprised that it apparently is not on the National Register of Historic Places. If it is on the National Register, I never saw ! Deacon Robert Haseltine would be my 8th grandfather. I plan to make my first tripto the burying ground in mid May 2013. I am thrilled to find this site. Many thanks to all involved with the site and preservation of the graves. last visited this cemetery was late 1990's. It was so over ground with brush and trees, I was unable to locate any of my family, the Kimballs and other family connections. I will try again, soon, when the weather gets warmer. Now that the brush is cleared from the site. Thank you. Bruce. Thank You many times over for the work between studying the stones and cleaning up the final resting place for many of our relatives. For several years this place remained poorly maintained and we always were sure we had family there but until recently studying our family lines we all are discovering our own buried heritage. 7th, 8th, and 9th great grandfathers are in there somewhere. Keep up the great work! I am a descendent of Benjamin and Mercy Kimball, and their son David (who married Elizabeth Gage) and who lived, died and was buried in this cemetery. Thank you for the wonderful site! The photos and the careful details that are provided are such a boon to armchair genealogists, such as myself who are unable to travel to visit in person. David and Elizabeth Wood are my 7X great-grandparents and it is special to see their final resting places preserved. I also look forward to reviewing all the Hazeltines buried here since that is another branch of my tree. I am directly descended from Thomas Hardy through my maternal grandfather Carroll Bartlett Hardy (1889--1943). Thank you for all the work being done to restore & preserve this precious heritage location. Great site!! I was very excited to see images of the headstone for my ancestor Thomas Hardy. Thanks for doing this very important work. This is my many great grand parents burial ground. We visited several years ago and want to come back. Thank you for making this available. I plan to make a trip to Bradford soon. THANKS FOR FORWARDING ACCESS TO THIS GREAT SITE! This Burial Ground Is loaded with Carletons, my ancestors. We plan a visit tomorrow. Phebe Her(r)ick is my ancestor, her husband Ebenezer died at Bunker Hill. Thanks for the great site! One of these days I would like to see it for myself. Thank you for posting photos and burial info! I have been researching family history for 5 yrs now and decided to go thru each township now for info on how these previous ancestors lived and what their occupations were. The families of Goodwin, Graham, Kimball & Webster are related. I appreciate this site it has a great deal of info. Thank You for the time invested. It has taken me back 7 generations. Awesome!!!!! I am the 8th Great Grandaughter of John Spafford (Spofford). I had read he was buried here and am glad to have it confirmed. John Spofford founded the Rowley, MA. mentioned in the video. Rest in Peace, Great Grandad. Like several others, I am a descendant of Benjamin & Mercy Kimball, as well as the Days, Tennys, and Hazeltines. I've visited the burial ground several times, the first with my parents in the 1950's, and later in the 70's and 80's. I'm glad to see it cleaned up, and indexed. Wonderful work. Somewhere probably now among those unreadable markers, is buried Martha Smith Burbank Hardy. Her gravestone image can be found at FindAGrave.com in this cemetery. The image shows a badly broken and barely discernible name. The name "Hardy" can be read. I am descendant of Thomas West, my 8th great grandfather, who resides in Edmonton, Alberta. I am so pleased to have found a picture of his headstone that I can finally read. I had one picture of it that my 1st cousin twice removed included in her copy of our family history, a splendid 289 page tome covering our arrival to the settling of wisconsin(1836) and beyond. Thank you so much, and can you tell if Wests still live there? I just found your site in my website's statistics and was glad I looked!!! I'm descended from Benjamin & Mercy Kimball. I'll be adding up links to your site from the genealogy pages for everyone you have images of !!!!!! Thanks so much for the beautiful pictures of our history! I am a member of the Tenney Family Association. The Burial Ground looks great. Thank you for allowing a semi-homebound person like myself to 'travel' through the internet to 'see the Bradford Burial Grounds' via your video. Several years ago I spoke to a sexton of another cemetery in Haverhill as I was/still am trying to find the burial place for Hannah Dore Hamilton 1793 (Athens, ME) - Oct. 3o, 1881 in Haverhill, MA. He suggested I check out the Bradford Burial Ground. Hannah 'is not here' either unless Hannah did not or does not now have a grave stone. It was precious to 'see' in person this Burial Grounds via your video. Thank you for taking time to do this project and post it to the web. My Great Grandfather, on My Mother"s side Haseltine donated the land for this cemetery in the 1600s I was named after My Great uncle Steve Hazeltine. More than just strange, that more than ten generations later I would live only a quarter mile from this burial ground. I regret that I know very little about the details, John Hardy knows more about the Hazeltine's than I do. shame :( John we will talk this winter about when to acquire the flag 8' "Betsy Ross" style. This is interesting. I have visited this place. My mother was a Haselton. We know that her family is descended from these Haseltines. There are a number of spellings. My grandmother's husband, George Irving Haselton was president of the NH Senate for many years and at one time, ran for governor. His portrait hangs in the NH state house. Many thanks for all the efforts involved in preserving the history of our fore fathers. We are honored to be a small part of these efforts and appreciate all that you have done to make this possible. What an absolute blessing your site has been to me. After contacting John and receiving his gracious permission, I was able to add pictures to posts of folks that are listed at www.findagrave.com. I also created memorials for those who didn't have them, using your information. I believe it's a great partnership that will benefit a lot of folks. Now I'd like to see if there's a way to post your map on the title page for the Bradford Burial Ground or a direct link between the two. Great resources, both! Thank you to all the folks who worked to provide the information and pictures here at your site. I know it has been a labor or love and respect for those who have gone on before. I can’t express what a blessing this site is. I have a lot of ancestors there and for our family to be able to see the tombstones and what is written on them is a true gift. I know a huge amount of time and effort has gone into putting this together. It is greatly appreciated. Wonderful website. Great to see Ancient Burial Grounds cleaned up and hear about all the work that is being done to keep it clean and in locating buried gravestones and unidentified graves. Without this we would have lost a very important historical site. I am a descendant of Thomas Hardy (tenth gen.) Great site. I am a descendant of Thomas Hardy, Sr. of Bradford. My wife and I visited the 1665 Burying Ground several years ago after receiving directions from the special collections department at the Haverhill Library. We are please to read about the update from John C. Hardy. Thank you for the work you are doing in the Bradford Burial Ground! My newly discovered ancestor, Nathaniel Fales, is buried there. What you are doing is very important. Very nice job on the site. Let me know if there is anything that you need from me in the future. It was nice to meet with you this afternoon (July 26, 2008) at the BBG. Great job. I am on the Tenney memorial stone committee. Thank you for all you are doing to help the TFA with their cemetery project. Enjoyed this site.